500 Days Of Film Reviews Behind The Candelabra And Finds An Entertaining Movie With An Astounding Performance From Michael Douglas. It was on the set of his 2000 film Traffic that Steven Soderbergh first mentioned his Liberace project to Michael Douglas. Fast forward thirteen years to 2013 and the director attended Behind The Candelabra’s international premiere at The Cannes Film Festival. The catalyst that drove the film from concept to finished product? The publication of Scott Thorson’s memoir about his life and relationship with Liberace. This gave Soderbergh an entry point into a story that is less about the bling and more about relationships and their complexities. Before I watched this film, I knew very little about Liberace. I knew that he was famous in the 60s and 70s - mainly for playing the piano. I knew that he wore incredible costumes on stage, almost drowning in sequins, furs and ruffles. I knew that, despite being gay and despite his overtly camp performances, Liberace denied his sexuality in public. He even sued the Daily Mirror for hinting that he was gay - and won. Apart from that, nothing. And I wasn’t much interested in finding out more, to be honest. That was until I heard that Michael Douglas was going to play him - then I was intrigued. Douglas is astounding as Liberace. He disappears into the role and is completely convincing. Crucially, his performance is not mimicry. While there are some brilliant scenes featuring Liberace on stage, Soderbergh focuses on the performer’s life behind closed doors with his lover of five years, Scott Thorson (Matt Damon). Damon is superb in this film. His is a demanding and complicated role that required him to undergo a total transformation - in more ways than one. He starts the film as a very outdoorsy man, working with animals and hoping to become a vet. As his relationship with Liberace deepens, he is almost imprisoned in Liberace’s opulent inner sanctum. We, the audience, are also kept inside as Soderbergh allows us to feel the intense claustrophobia of their lives together. The impact on Thorson is tough to watch. By the end of the film, it is hard to reconcile the man from the start of the story with the broken man at the finish. However, Behind The Candelabra is not just a traditional biopic. Neither is it a political movie about gay rights. No, this film is more a complex portrayal of a loving, yet ultimately doomed, relationship. We see Liberace (or Lee as he is called off stage) and Scott’s relationship grow and blossom. Despite their often surreal life, their love feels real. As a result, when their relationship breaks down, the loss, sadness and regret are powerfully felt. 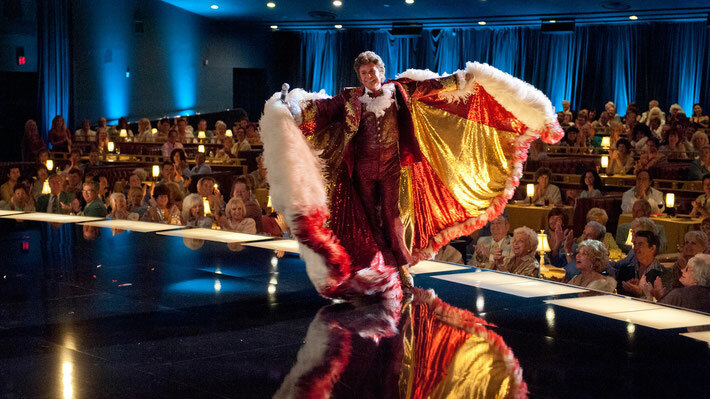 While there is much emotion and poignancy in Behind The Candelabra, the film is also really funny. There were several scenes where I laughed out loud. Many of those had to do with Rob Lowe’s brilliant portrayal of plastic surgeon, Dr Jack Startz. What a fantastic cameo! Behind The Candelabra is a wonderfully entertaining biopic, elevated by a superb narrative and astounding central performances. I would recommend it highly. Soderbergh not only directed this film but he was also director of photography (under the pseudonym of Peter Andrews) and the film's editor (as Mary Ann Bernard). At the height of his fame from the 1950s to the 1970s, Liberace was the highest-paid entertainer in the world. I loved the authenticity of the film regarding the pack of small dogs that Liberace has in his house. They were always barking away! 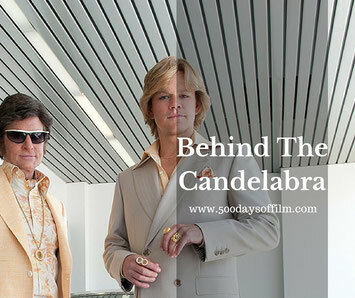 Have you seen Behind The Candelabra? If so, let me know what you think of this film in the comments section below!